The colorful suction bowl set is specially designed for over 6 month babies, it adopted an food grade edible materials, very safe and healthy, it can be used as a training bowl which help baby to learn how to eat food by themselves. Very ideas for fashion parents, and let baby enjoy growth! ♥ Made of safe and food grade materials. ♥ Come with handle on both sides. ♥ Please use the suction bowls after cleaning with warm water. ♥ Please use the suction bowl on the smooth surface to maximize the suction of it. ♥ This product must not be used in the microwave oven, and use ozone disinfection instead of high temperature disinfection. ♥ Please do not use this product as a toy, and use it under adult. supervision. PREMIUM MATERIAL: made of safe food grade materials, odorless and harmless, BPA free, heat-resistant, have great performance on corrosion resistance. NON-SLIP SUCKER: have a sucker with excellent adsorption capacity at the bottom of bowl, spill proof and stay put and prevent the baby from tipping over and falling while eating. 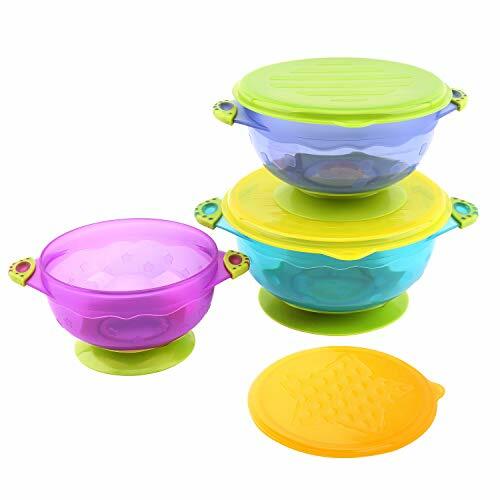 SEPARATE SEALING LID: come with separate sealing lid that able to keep food warm and fresh for at a certain time, very great for to-go storage, and makes it easy to take food when you go out with baby. EAR HANDLE DESIGN: come with ear handles on both sides, use safe and healthy TPE material, anti-slip and anti-hot, double protection, translucent bowl body to allow you identify foods easily. 3-PACK SET: 3 pieces in one set with 3 different size, suitable for different foods storage, it alleviates the parents' troubles during the eating practice of babies, and actually realizes the purpose of happy feeding. If you have any questions about this product by Zooawa, contact us by completing and submitting the form below. If you are looking for a specif part number, please include it with your message.